ELAN Home Automation Makes a New Hampshire Vacation Rental Much More Desirable! New Hampshire ski resort condo gives guests a taste of full home automation with mobile and voice control of climate, shades, lighting, audio/video, and cameras through an ELAN system. Imagine it’s dark and, after pulling up to your cozy vacation rental that’s snuggled between snowy ski-sloped mountains, you realize you’re not sure which condo is yours. Now imagine being able to pull out your smartphone and turn on the outdoor lights of the home to find your way. This exact scenario played out at Waterville Valley Resort in New Hampshire, where enterprising ELAN integrator and condo owner Joe Colangelo of C&T Electricdiscovered how home automation made a rental unit an exciting part of the travel experience, especially to guests using it for the first time. The backbone of the system is an ELAN gSC2 home controller, which ties all the disparate systems together so they can be controlled from a single interface. Niles outdoor rock speakers provide a second, separate audio zone on the rear patio, while the Sunfire Cinema Ribbon surround speakers and aSunfire subwoofer provide an unmatched movie watching and music listening experience in the living room. Lighting is controlled through a Lutron RadioRa2 system with keypads throughout the condo, and all of the equipment is protected by a PanamaxM4000-PRO surge protector and power conditioner with BlueBOLT remote energy management. More than just a convenient way to locate the condo, the system is an integral part of the guest experience, allowing them to control the thermostat, motorized window shades, lights, TV and music, and even view the exterior security camera feed, all from the ELAN App. 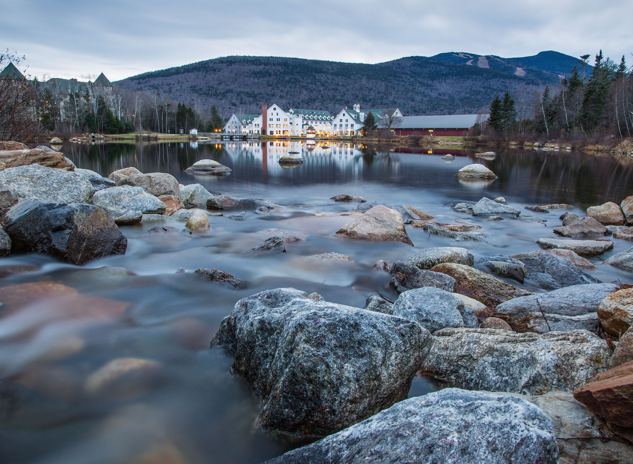 In a town like Waterville Valley, where many people own condos as rental properties, ensuring guests have a pleasant stay and leave good reviews is paramount. After seeing how much his house guests enjoy sophisticated home control, and how easy it is for anyone to use, Colangelo is hoping to convince other local owners that there is immense value in making modest upgrades to bring their rental properties into the 21st century. “For the most part, these prized vacation properties haven’t changed much since they were built in the 80’s and 90’s,” Colangelo said. “They might have a new TV, but they are largely behind the times when it comes to novel home technologies. My condo, on the other hand, allows guests to wake up say, ‘Alexa, open the window shades,’ to get a fantastic view of sunrise over the mountains, or ‘Alexa, turn off the lights’ when they go to bed. The unit includes a surveillance camera outside pointing toward the mountains, and another indoors that includes a “privacy” button guests can use to deactivate the indoor camera while they’re inside. And when they leave and new guests are scheduled, all Colangelo has to do is change the remote login password and share it with the new guests. The real test, according to Colangelo, is how easily guests can dive in to using the ELAN system without anyone on site to show them how to use it. Someone at C&T usually takes 5 to 10 minutes to guide guests through the mobile app after they download it, and that’s all it takes. In addition to the ELAN mobile app and Alexa, guests can also manage the home’s systems through a wall-mounted ELAN gTP7 touch screen in the dining area. Colangelo says this installation can be expanded in the future to include wireless multi-room audio. The ELAN system’s expandability and upgradeability make it a good choice for owners that want to incorporate the next big thing and provide the latest services to guests. “There are towns like this all over the country, and as people become more comfortable and reliant on integrated home technologies, they will come to expect at least basic home control when they travel,” Colangelo concluded.